In Orwell’s novel 1984, there is a figure called Emmanuel Goldstein who functions as an all-purpose enemy, even though we gather that he may actually have died some time ago. Osama Bin Laden has been used in a similar manner by the Powers that Be, by a process of identity theft during the last days of his life. In reality there have been no sightings or reports of him since 2001. I here argue that he died on or around December 15th, 2001, in consequence of the intensive bombing of his then-residence the Tora Bora caves of eastern Afghanistan; and that he had no involvement in the events of 9/11. Osama Bin Laden – Warrior of God or CIA Asset? It is a life which needs to become a film, a transcontinental drama. But, any film company making such could expect a glowing future…. Far safer, to make a film of the bogeyman we all know and fear – but, who never existed. The Sunday Times in March 2007 had a nine-page article about where he might be lurking, and how no-one had been able to find ‘the world’s most wanted man.’ It gave not the slightest hint that he might have died five years ago (Christina Lamb, The Invisible Man, The Sunday Times Magasine, ‘Who is hiding the world’s most wanted man?’). Pakistan was blamed, as if it could have hid him through the years, even though he was over six foot six high and his distinctive appearance was known all round the world. The article conceded that ‘the last positive sighting’ of OBL had been in the December, 2001 US attack upon Tora Bora. I did a book review concerning the speeches and videos allegedly produced by OBL. ‘Messages from Bin Laden,’ suggesting that all of them from 2002 onwards were faked. “We also have been hit with some of the traces of this campaign as we were accused of funding terrorism, and being members of an international terrorist organisation. Their aims in making these allegations were to place psychological pressure on the Mujahideen and their supporters so that they would forsake the obligation of Jihad and the resistance of oppression and American Israeli occupation of Islamic sacred lands. However, our gratitude to God, their campaign was not successful, as terrorising the American occupiers is a religious and logical obligation. . . .
As for their accusations of terrorising the innocent, the children, and the women, these are in the category “accusing others with their own affliction in order to fool the masses”. The evidence overwhelmingly shows America and Israel killing the weaker men, women, and children in the Muslim world and elsewhere…Then, killing hundreds of thousands of children in Iraq, and whose numbers (of dead) continue to increase as a result of the sanctions. Despite the continuing American occupation of the country of the two sacred mosques, America continues to claim that it is upholding the banner of freedom and humanity, whilst these deeds which they did, you would find that the most ravenous of animals would not descend to. . . .
As for what America accuses us of, of killing innocent people, they have not been able to offer any evidence, despite the magnitude of their expenditure on their intelligence services…Similar is our history with respect to our differences with the Saudi regime: all that has been proved is our joy at the killing of the American soldiers in Riyadh and Khobar” (October 1996). On the 20th September, OBL was officially designated by President Bush as responsible for the attacks. Then on 23rd Secretary of State Colin Powell promised that a paper would shortly be ready with the supporting evidence. Although announced repeatedly, no such paper ever appeared (Meyssan 9/11, pp. 82, 102). A letter by OBL of 24th September urges Muslims in Pakistan and Afghanistan to stand firm against aggression from the ‘Crusaders’ (R. Jacquard, In the Name of Osama Bin Laden (2002) has just this one post-911 letter, p. 258), and contains no hint that he might have been involved in the event of 9-11, still less any approval of the notion of attacking America. In mid-September the Taliban responded to US requests for OBL to be handed over, by saying they would be happy to do so, if some evidence for his complicity in the 9/11 event could be produced. (That may have been unwise, given that the UN Security Council had two years earlier passed a resolution demanding that the Taliban ‘hand over’ Bin Laden, though without specifying to whom (UN Security Council Resolution 1267, passed 15 October 1999); however, let us recall that he was regarded as a hero in Afghanistan for having driven out the Soviet Union). After that request for evidence was declined, the Taliban offered on October 1st to give over OBL for trial to an Islamic court in Pakistan – apparently with OBL’s approval; this proposal was vetoed by Pakistan’s President. Days later, the bombs started falling. On October 1st, Britain’s prime Minister Tony Blair averred: “I have seen absolutely powerful and incontrovertible evidence of his [OBL’s] link to the events of the 11th of September” (The Daily Telegraph, London, 1 October 2001). That statement was presumably related to the UK Government’s ‘Bin Laden Dossier’ which appeared on October 4th – a mere three days before the US/UK bombing began, of one of the poorest nations on Earth. That dossier lacked any references for its didactic and unlikely statements. It was described by the Independent on Sunday as ‘little more than conjecture, supposition and assertions of fact’. (For comments on untruthful information in this UK dossier, see Burke, Al-Qaeda, p. 17.) Only an ‘updated’ version of this document remains available to investigators. Earlier versions (cited by Meyssian 9/11, p.225) are no longer accessible. Jason Burke discussed this dossier, finding that eg its linking OBL’s name to the attack on US military personnel serving in Somalia was ‘almost certainly untrue,’ (Al-Qaeda, p.17). and it concluded: ‘the British intelligence specialists must have known that the dossier they gave to the Prime Minister to reveal to parliament and the British public to justify involvement in a major conflict included demonstrably false material but felt the war in Afghanistan needed to be fought and the public needed to be convinced of it. Painting Bin Laden as profiting from the heroin trade served the same purpose as atrocity stories about Germans in World War I (Burke, Al-Qaeda, p. 17). On November 3rd, after the war had begun, al-Jazeera released Bin Laden’s final major statement, in which he viewed Afghanistan as the last in a series of ‘crusader wars’ against Muslim nations, and insisted that there was no evidence of any Afghan involvement in the event of 9/11. British MPs would, I suggest, benefit from reading this statement. The centrally-important fake ‘Bin Laden’ video appeared in mid-November 2001, shown on al-Jazeera television station, with the main character expressing approval of the 9/11 event and apparently having some degree of foreknowledge. Although much of the tape was only semi-audible, the Pentagon produced its English ‘translation’ on Dec 13th. 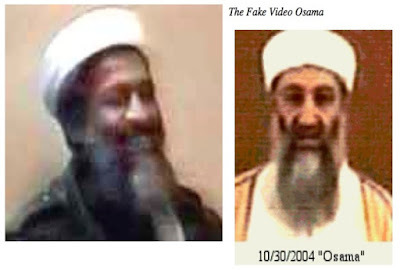 A year later, in November 2002, the Swiss Institute for Perceptual Artificial Intelligence in Lausanne, commissioned by France-2 television to analyse the tape, expressed confidence that the voice heard was not that of Bin Laden. The main figure of that video did not even resemble OBL, so it remains a mystery how media hacks were prepared to go with such a story at all. That video was the only evidence the US ever produced, to justify its bombing of Afghanistan. Radio transmissions of OBL’s voice from Tora Bora were normally intercepted by four different intelligence agencies, American, Pakistani, Saudi and Egyptian (Ahmed, War on Freedom, p. 220), up until 14th December 2001 when they ceased. His funeral took place on the 16th in Pakistan, as reported in Pakistani and Egyptian newspapers, at an undisclosed location. A four-page will of his surfaced some months later, dated 14th December. In a videoed speech of his broadcast 27 December, 2001, OBL declared, ‘Regardless if Osama is killed or survives, the awakening has started, praise be to God,’ (Jason Burke, Al-Qaeda: The True Story of Radical Islam, 2004, xiv) and that was his (posthumous) final broadcast. The Pentagon was able to produce that fake OBL video, without fear of OBL denouncing it, because (I suggest) it knew where he lay, dying. Since then a series of ‘Bin Laden’ tapes has been fabricated, to help the world live in fear. His image has been misused by those concerned to promote global terror. A shelfload of untrue books linking OBL to 9/11 exist, of which Jason Burke’s Al-Qaeda the true Story of Radical Islam is only the most recent. One would prefer to hear from some Muslim researchers, in ascertaining the identity and life-course of this character, fully demonised by the US and UK. Max Hastings wrote on 3rd Sept 2004 in the Daily Mail, ‘If Bush gets back to the White house, more than any other man he will have Osama bin Laden to thank’ – too true! The term ‘Al-Qaeda’ started to be used around 1997/8 as a designation for Islamic terrorist groups, which means ‘the base’ in Arabic. (It was OBL’s name for his computer file, used while employed by the CIA in Afghanistan, to co-ordinate the ‘jihad’ against the Soviet Union: Meyssan, 9/11, p.99.) In 1998, FBI-led investigations of bombings of African embassies started using this name (Burke, Al-Qaeda ref 6, p. 6.). These groups lacked any sort of insignia and have been well described as ‘a loose collection of groups and individuals that doesn’t even refer to itself as “Al Qaeda.” Most of the affiliated groups have distinct goals within their own countries or regions, and pose little direct threat to the United States’ (K. McCloud and A. Dolnik, Debunk the myth of al-Qaeda). Thus there do not exist, or hardly exist, documents by members of such groups referring to themselves as ‘Al-Qaeda’ (Brendan O’Neill Does al-Qaeda exist? ), although one would like to hear more discussion of this issue. The BBC film series ‘The Power of Nightmares’ gave a compelling account of how the ‘Al-quaeda’ threat was mocked up, to help the people live in fear. By 1998 the FBI had issued an arrest warrant for OBL in six countries (for his presumed involvement in the Nairobi and Kenya embassy attacks of that year), and yet a British couple had the following experience. Alan and Cindy Thompson ended up in the town of Zhob, Pakistan, after making an unexpected detour, and stayed overnight. They left quickly the next day, after discovering that Bin Laden was in town. They discussed their alarm and surprise with American aid workers, who told them of a similar experience they had had in Kandahar, Afghanistan, where they had to move as their offices were right next door to bin Laden. The Thompsons reported their discovery, but were ignored by the FBI. Cindy stated: ‘We were gobsmacked. We found it incredible that we were offering to give firsthand true information about the most wanted man in the world and the US embassy couldn’t even be bothered to get off their butts…it is about time that this story is told to the world to let the people know the truth…the hunt for bin Laden is a farce.’ (Kenyon Gibson, Common Sense: A Study of the Bushes, the CIA and the Suspicions Regarding 9/11 (2003), p. 201. The Thompsons are living in Lincoln.) Indeed! On the very morning of 9/11, George H.W. Bush met with Osama bin Laden’s brother, Shafig bin Laden, at a conference sponsored by the Carlyle Group in the Ritz-Carlton Hotel in Washington, DC. In the ensuing months, the UK & US dropped twelve thousand bombs on Afghanistan. To quote Meyssian: ‘The greatest army in the world, for its part, was unable to find the alleged Public Enemy No 1 it was sent to arrest, while Mullah Omar escaped to Pakistan on a motorbike’ (Messyan, 9/11, p. 125). There a danger that the real OBL will be lost in a mythologizing process – as the authorities may desire – so that we are left merely with multiple refracted images. (For example, an alleged interview by an Arabic paper in November 2001 has OBL denying that he had kidney trouble or that he visited the Dubai hospital, and has him affirm his readiness to attack America.) In October 2004, the U.S. Secretary of State Colin Powell averred that the Pentagon knew where OBL was, somewhere in western Pakistan. Emmanuel Goldstein was a much-needed figure. Confirmation of how indispensable OBL was as an enemy-image comes from Kabir Mohammed’s story. In the year 2000, Taliban leaders were anticipating the danger posed by OBL’s presence in their country, and consulted Kabir as an ambassador over what to do. He suggested OBL be handed over to the newly-established International Criminal Court in the Hague, and set up a meeting in August 2000 between Taliban representatives and EU official Reiner Weiland in the Sheraton Hotel in Frankfurt, to ascertain in what way they could hand over OBL. This offer was relayed to the U.S. Government (which does not sound quite what the Taliban had asked for), who responded by appointing Kabir as an Afghan ambassador! In mid-November 2000, the Taliban moved OBL and his henchmen to Daronta, 30 miles outside Kabul, effectively placing them under house arrest. The Taliban placed him in this confined location, where he could be either destroyed by missile attack or arrested and deported. Delays and procrastination followed, with U.S. apologies being repeatedly sent for inaction. Then suddenly it was too late, and on September 15th Kabir was informed ‘the train has moved on’ and the option now was either the Taliban’s total surrender, or war. He resigned from his ambassador role, and soon the bombs started to fall on his country. Reading between the lines, the U.S. did not want OBL handed over to an International Criminal Court, where his open testimony could cause a lot of harm, but did want him stuck in Afghanistan, so they could weave their story around him. ‘The one American who knew more about bin Laden than anyone else’, John O’Neill, was investigating OBL’s alleged involvement in the bombing of the ship USS Cole. He was the FBI’s counter-terrorism chief, in its New York National Security Division office, his speciality being Islamic terrorism. But, he became unduly keen on the pursuit of OBL, and was warned off the case: in November 2000 he was thrown out of Yemen where he was investigating the Cole bombing, then in August 2001 he fell victim to a framed character-blackening and was dismissed from office. He was finally moved to a different job – in the Twin Towers. (O’Neill emerged from the first Twin Tower inferno, then went of his own accord into the second one to try and rescue people, where he met his nemesis.) He does not seem to have appreciated that catching OBL was not quite the name of the game. Bin Laden was the “Most Wanted Man” on Earth – and America wanted to keep it that way! On November 2nd 2004, a macabre Halloween reappearance of ‘Bin Laden’ handed the US election over to Bush. The film that Al-Jazeera broadcast in Quatar was highly blurred. Nico Haupt wondered ironically ‘I am meanwhile interested, where the ISI always get their stand-in actors for former CIA payroll buddy Usama Bin Laden’ (ISI =Pakistan Intelligence Service). The lookalike figure who read the script sounded like someone in a rather bored mood reading a speech, and he had different eyebrows from OBL. One might have expected OBL to speak in an animated way from the heart about the things he believes in, indeed an actor would have performed in a rather more animated way, suggesting that this reader was chosen for the coincidence that he is an OBL look-alike. He was clearly reading a script, one saw him turning the pages, and there was an obvious cut in the recording. The 9/11 Commission Report–The 9/11 Commision Report (2004), cites no authors or editors, only a list of Commission Members with no hint of who they are or whether they are contactable–wove a story about OBL quite incompatible with that told here. Virtually all of its references were uncheckable, as alluding to FBI memos etc outside the public domain. It contained no quotes from OBL: quite a few statements of his have been quoted or alluded to here, not one of which appears in the pages of the Commission’s Report, despite its extensive discussion of him. Its references include ‘interrogations’ of Muslims – under torture, one assumes. I suggest that its account is largely fictional. Let us hope that some attempt at real biography will be attempted, before this intriguing character vanishes into that fractured hall of mirrors. ‘I hear his voice. He is alive. It takes only a brief round of phone calls to the Middle East and south- West Asia for my sources to confirm that it was Osama Bin Laden’s gravelly voice that is threatening the west in the short monologue transmitted by the Al-Jazeera television channel’. We are gobsmacked that Mr. Fisk believes in the authenticity of the Pentagon-translated fatty Bin Laden tape of November 2001 which turned up in in Jalalabad, owing merely to a phrase it used which, he recalled, OBL had used to him some years ago – concerning the envisioning of the 9/11 event in a dream (p.1275). He might here pause to consider the miscasting of the holy month of Ramadan in the speech, in a way that no Arab could ever do. ‘He [the Deity] will give us blessing and more victory during this holy month of Ramadan’ chortled fatty Bin Laden (in the Pentagon’s translation) with the video reportedly bearing a date-stamp of November 9th – while the month of Ramadan only began a week later, on the 16th. Its forty minutes of rambling dialogue gave no hint of the ghastly carpet bombing then going on around Jalalabad. The embarassment of having Secretary of State Clinton talk about bin Laden in Pakistan was horrific. He has been dead since December 13, 2001 and now, finally, everyone, Obama, McChrystal, Cheney, everyone who isn’t nuts is finally saying what they have known for years. However … Since we spent 200 million dollars on “special ops” looking for someone we knew was dead, who is going to jail for that? Since Bush, Rumsfeld and Cheney continually talked about a man they knew was dead, now known to be for reasons of POLITICAL nature, who is going to jail for that? Why were tapes brought out, now known to be forged, as legitimate intelligence to sway the disputed 2004 election in the U.S.? . . . In May 2011, his death was proclaimed by Obama as having just happened. Not one single UK paper or media outlet expressed doubt. Evidence does not support the notion of Muslim hijackers as responsible for 911– see David Ray Griffin, The New Pearl Harbour, Disturbing Questions about the Bush Administration and 9/11(2004)–pointing more to a source within the US military, who devised the event themselves. This issue has to be central in answering the question, “Who was Bin Laden?” Someday, truthful accounts of the 28-year old Arab who visited US military bases as Tim Osman in 1996 may appear – but, not just yet. Those responsible for engineering the event of 9/11 had to have confidence over when OBL was going to die: he had to be in Afghanistan and take the blame, he had to be alive when the country was invaded, but had to be incapable of replying and had to fade away as the Pentagon’s bogus identity-theft video was promoted around the world, loading the guilt onto him. Nickolas Kollerstrom is an historian of science and expert on the 7/7 attacks in London, about which he has published TERROR ON THE TUBE, which is being released in an expanded and revised version this month. He has followed the trial and tribulations of Muad’Dib and has been present for the formal inquest on 7/7. Several interviews with him are archived at http://radiofetzer.blogspot.com. Whenever an author mentions David Ray Griffin, to me,, all validity of their article flies right out the window. To believe all of the crap that comes out of his books one must also believe that thousands and thousands of people were involved in conspiracies. Kollerstrom writes, but has no proof at all that OBL was dead long ago,, just more "sources" and just more theories. Yes, something is very rotten, going all the way back to the PNAC paper in 2000 "Rebuilding America's Defenses" and the well known "Pearl Harbor type attack " statement,, something is rotten about what we did to Iraq,,something is rotten about this supposed OBL assassination,, it all stinks,, but if OBL really was the leading terrorist in the world,, wouldn't it have been much more wise to capture and interrogate him than to just kill him ? Yes,, we probably are being played for fools. Wow. That was a good article. I hope it was accurate. Osama bin Goldstein may be dead…but Al-CIA-duh lives on…let's hope enough people wake up before they decide to have the next "big event" – to further their goal of creating a new world order out of chaos. It's quite laughable to watch the US govt. fail to get their story straight over a completely and badly fabricated tale of a death a decade too late. How stupid do you have to be? Dumped at sea? Do me a favour please!! Your statements are contradictory. And Griffin did not say anything about thousands of people. Nothing could be more farcical than the official explanation. The point is bin Laden was not wanted by the FBI for Sept. 11, 2011. They knew he had nothing to do with it. And don't forget Police Chief Magazine did an article about a 10 kiloton dirty nuke going off in Chicago in 2008. So it would be best to know who our real enemies are. If this is true, as I believe it is, then hoow does it progress to being the "official" story regarding these events, the one that our children and grandchildren will hear. Hoarded knowledge is not much above ignorance. Production Vidéo Lausanne-Smart Cuts is a video and animation Production Company based in Lausanne, Switzerland that produces affordable content for the web, TV and live events. Smart Cuts now offers interactive video, animation and infographics.